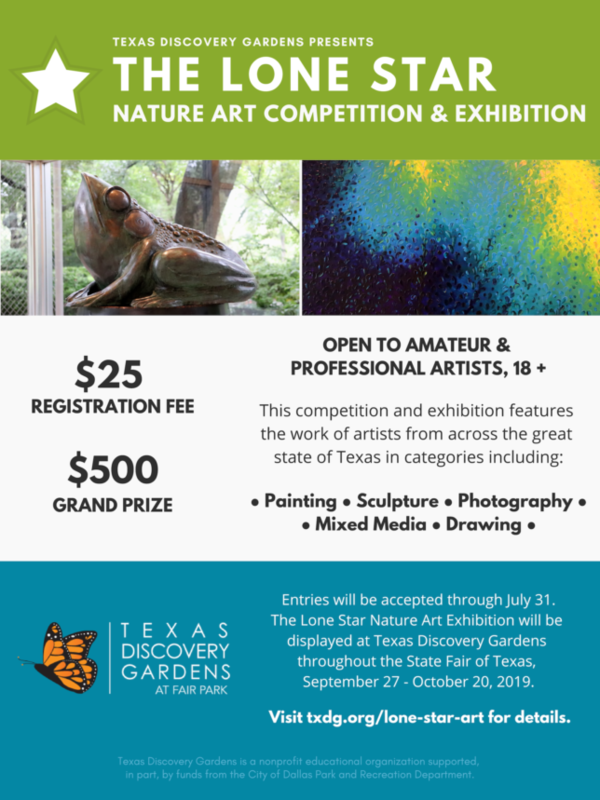 The Lone Star Nature Art Competition is back! Presented by Texas Discovery Gardens at Fair Park, this competition and exhibition features the work of artists from across the great state of Texas. Online submissions will be accepted through July 31. The Exhibition will be displayed at Texas Discovery Gardens throughout the State Fair of Texas, September 27 – October 20, 2019. Judges representing and picked by Texas Discovery Gardens, including Discovery Gallery Curator Brenda McKinney, will choose winners and runner-ups. 1st place, 2nd place, 3rd place, and Honorable Mention ribbons will be awarded to the top entries. Best of Show will receive a $500 Grand Prize. Entrants must complete the Lone Star Nature Art Show Entry Form. Entrant must complete one form per piece. A high resolution (300 dpi or higher) digital image of the art piece must be uploaded with the form. If the submission is 3-D (i.e. sculptures and wood carvings) at least four (300 dpi or higher) digital images must be submitted — front, back, right side , and left side. Entrant will provide a statement containing the story and inspiration behind the design and its content, must be turned in with the form. Entrants may submit up to 5 pieces. $25 Registration Fee per entry. Entrant must complete one submission form per entry.